ServiceMaster serves the Wichita area and South Central Kansas with key licences in Wichita, Hutchinson, Derby, and Winfield. We provide Wichita office cleaning, carpet cleaning, janitorial services, mold removal, and around-the-clock emergency fire and water damage restoration. What Are Our Core Cleaning Services? What are some of the reasons customers use ServiceMaster Clean in a Wink? Proven Trust Factor - We are referred by nearly all local and regional carpet & upholstery retailers (carpet & upholstery cleaning), heating & air contractors (air duct cleaning), and plumbing contractors (water damage). DEPENDABILITY - Trustworthy & Reliable. We became the leading cleaning company in the same way that we continue being the leading cleaning company -- by serving one customer at a time. 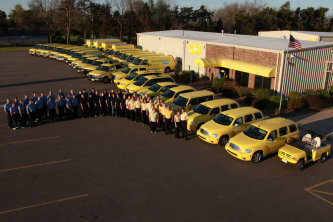 For more information or for a free estimate, contact us 24/7/365 at www.smcleaninawink.com.